Hooked up my Happs trackball - see below! The KE72 scans 72 individual inputs, with no chance for ghosting - it's not a matrix! Any input may be programmed to output up to 32 keystrokes when pressed, and up to 16 keystrokes when released. You can use custom connectors, or IDE ribbon cables for your wiring. The user creates his own configuration file for loading into the KE72. This file is a text only file. Once the configuration file is created, the user runs a supplied program to load the configuration into the KE72. The KE72 may be loaded through the keyboard port (DOS mode) or through it's serial port (DOS or Windows). The KE72 has an option for a Mouse/Trackball interface. The KE72-T model emulates a PS2 mouse as well. This allows you to connect a Track Ball or similar device to the KE72 and have it emulate a mouse. The Mouse/Trackball option can be purchased as an addon later to upgrade the KE72 as well. Check out the last item on the prices below. 6 pin miniDIN Male/Male Cable, 6 ft. The 72 discrete inputs are spread across two blocks of inputs that will fit an IDE ribbon cable. The left and right pairs of both sections are grounds, and all other pins are the 72 inputs. Shorting (connecting) any of the 4 grounds to one of the 72 pins results in that key-code being sent to the computer. (Click for a larger view) From left to right, you see the connector to the PC keyboard port, the connector to the keyboard (passthru), the RS-232 serial port for programming, and the connector to the PC PS/2 mouse port. From left to right, the trackball/mouse interface, and the smaller connector is for the three mouse buttons (and one ground). KE72/T model only. A few days after I purchased my Happ Controls trackball and such, it arrived in the mail. Very fast shipping. I couldn't wait to build a panel to mount it to, so I temporarily hooked up all the cables and had it perched precariously on my keyboard drawer. 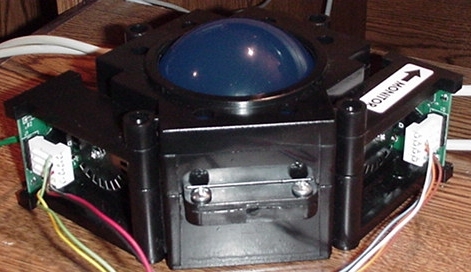 The trackball I purchased from Happs was a translucent blue 3" ball, and it works, well, exactly like an arcade trackball :) I didn't order the parts needed to light the trackball up though, as I didn't realize it was extra... I've listed the parts and prices below for those who want to follow suit. The parts without a price are the ones I didn't order and can't find prices for yet, but they're tiny and shouldn't be more than $5 I'd guess. All in all I'm very excited about this setup! 90-1005-00 Screw for lamp assembly $? 91-1219-00 12 Volt lamp $? The trackball cable plugged into the encoder. (Click for a larger view) Cables, cables everywhere! 1 to the keyboard, 1 to the keyboard port, 1 to the PS/2 mouse port, and 1 to the trackball. All the cables here supplied by Hagstrom, the trackball cable supplied by Happs isn't used. (Click for a larger view) The overall view. Everything looks great, the only potential gotcha I can think of is the length and connection of the trackball interface cable - you'll either have to mount them fairly close together (no problem on a 1-control panel system) or splice the cable and use your own connecting scheme in between the two ends, which is no big deal if you're doing multiple control panels anyway.